DISCOVERING OUR STORY TELEVISION PROGRAM AIRS THIS SUNDAY AT 1 PM | Wisdom of the Elders, Inc.
Dez Ramirez will be Wisdom’s special guest on the Discovering Our Story TV program this Sunday, May 7 at 1 pm. The show airs on Comcast Channel 11 and will be rebroadcast twice over the next week. Dez works at Weiden + Kennedy and has been volunteering this past year on Wisdom’s Special Event Committee. 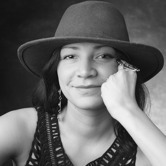 She helped us plan and publcize our recent Northwest Indian Storytelling Gathering, the Traditional First Foods Symposium and most recently, the Native Wisdom Film Festival which was held in partnership with Northwest Film Center at Portland Art Museum.